Tumblr is a peerless place to express yourself as well as discover your daily fix of cool GIFs and memes. However, the NSFW content on that site has risen dramatically over recent years, so some adult-related blogs are curbed with a Safe Mode warning. 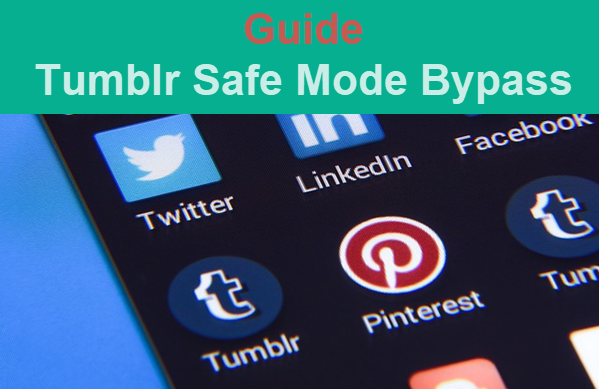 Unfortunately, the Safe Mode lock also applies when you do not sign in with your Tumblr account. Don’t worry. If you’re an adult and don’t want to create an account to hang out on Tumblr, you will learn how to bypass Tumblr Safe Mode without account in this tutorial. 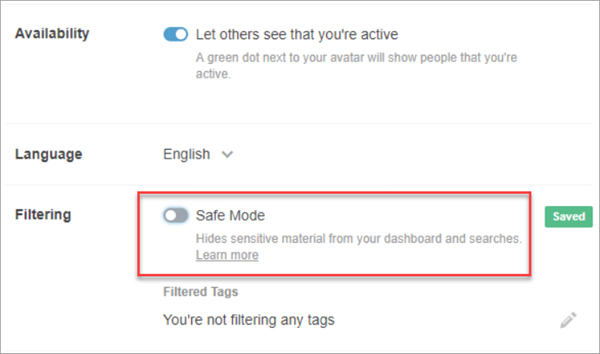 Tumblr has the Safe Mode turned on for users of all ages, so you need to turn off Tumblr Safe Mode manually if you have an account. Step 1. Sign in to your Tumblr account, click the Account icon, and then select Settings. Step 2. In Settings, select Filtering section, hit the switch next to the Safe Mode to turn it off. That’s it! Now you’ll be able to search for and access blogs or posts that were flagged as ‘not safe for work.’ Nevertheless, remember that once you sign out, you lose access to ‘not safe to be viewed at work’ content, so make sure to log in whenever you want to retrieve the access. For iOS device, Safe Mode setting is not turned off on Tumblr app, but on the Settings app of iOS. Open the Settings app, scroll down, and then tap Tumblr. Tap on the Safe Mode, then choose Don’t hide anything option to turn Safe Mode off. You will be able to access the NSFW content once you re-open the Tumblr app. Turning off Tumblr Safe Mode on Android is quite similar to doing it on web pages. Open the Tumblr app, click on the Profile tab on the bottom-right corner, and then tap on the Settings icon. In Settings, tap General settings > Filtering, hit the switch next to the Safe Mode to turn it off. The Safe Mode setting doesn’t sync cross platforms, so you need to individually turn it off the Safe Mode setting on the desktop, iOS, and Android. Now you can freely browse GIFs and even download Tumblr videos. Kindly Remind: In case you accidentally deleted a finished photo before uploading to Tumblr, you can try a free photo recovery software to get lost pictures back. There’s really no purpose to waste time creating a Tumblr account just to defuse Safe Mode. There are certain websites that let you browse on Tumblr without restriction. TumblViewr emphasizes a minimalistic design, but will not let that fool you. Just type in the name of any blog, and it instantly starts loading photos, video or GIFs in thumbnail format, which makes it an insanely useful way to quickly scan through hundreds and thousands of posts. You can also click on a thumbnail and have the access to the full resolution version of the related image or video or GIFs. Another valuable website that will let you access restricted content in a jiffy is Tumbex. It will also allow you to search for all the posts individually. And, the fact that it displays images in a customizable grid format which makes navigating complex Tumblr blogs a breeze. You can also determine the quality of the posts in SD, HD, and MD — that images load in to manage bandwidth. GramUnion will let you post-hastily access any Tumblr blog confined or unrestricted by simply inserting its name. In fact, it’s even way cooler that Tumblr itself will due to the fact that you can filter posts by media type — image, video, audio, etc. You can also embed hashtags to easily bring up related posts and blogs. You can also sign in using your Facebook or Google accounts and label/bookmark blogs and posts for surveying later. Online constraints are almost always a bad thing, but it’s understandable in this case since NSFW content isn’t for everyone. And at least, Safe Mode can be easily turned off, just like you can unblock blocked websites. Feel free to share with us more fun tips & tricks about Tumblr.